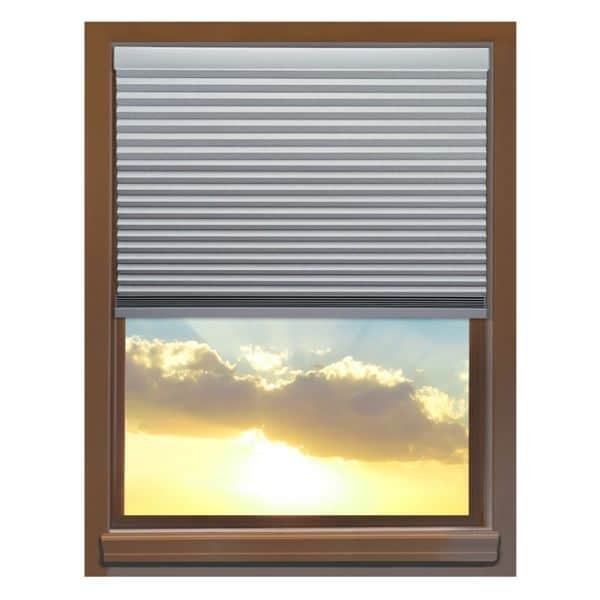 With a chic contemporary style and beautiful platinum coloring, this Linen Avenue cordless blackout window shade is the perfect addition to your home. The shade is foil lined, allowing no light to pass through and maintaining privacy as well as providing energy efficiency to your windows any time of year. A smooth, cordless operation keeps the shade child and pet safe and makes it easy to raise and lower, while a grey color coordinating satin smooth headrail and bottom rail complete its look, lending a stylish accent to any room. Inside Mount: Measure window horizontally at the top, middle, and bottom. Subtract 1/4 inch from the smallest measurement and order this width. This will give 1/8-inch clearance on each side when raising and lowering the shade. Outside Mount: Add 4 inches to the width of your window measurement, and order this width . This will allow for a 2-inch overlap on each side of the window. You may want to add to the length for overlap as well.